The cover (front and back) for Prosa issue 4/2018, pluss vignettes inside. Issue theme: The publishing house’s comprehensive destruction of their unsold books. Type and layout by Aina Griffin. The cover (front and back) for Prosa issue 4/2017. Revolution is the main topic, among many other things with an in depth focus on the role of writing/literature, in revolutionary processes. As you can see I let the concept be revolutionaries carrying books as flags and banners going against the tide. And much to my joy I got the opportunity to draw the type for the topic title, in a style that echoes the style of the illustration. Illustrations for the cover of Prosa No. 1 2017 and accompanying the lead essay written by Andreas Hompland, about the enthusiastic and super active ski profet Thor Gotaas, who has been tracking the social and cultural life-history of skiing, running and other means of wanderings in natur, for years and years. In my blog section you can see a reference photo of me in preparation for the main illustration. The focus on trees is due to his famous response concerning the production of one of his books, whereas he planted the amount of trees approximate to the amount of trees that went into the paper production of said book. Layout and design by Aina Griffin and Susanne Brochmann for this and the following spreads. Cover for Prosa No. 5 2016 (Tidsskrift for sakprosa). The issue is called From James Joyce to James Bond – The conveyor Umberto Eco (Fra James Joyce til James Bond – Formidleren Umberto Eco), where Siri Nergaard depicts the many sides of Umberto Eco, her work-relationship with him and his legacy. Especially his focus on iconography and if there is a singel ouvre or red thread to his life's work. The original drawings is displayed at the top, and then you'll see the applied drawings on the cover and some of the spreads inside the magazine. Instead of a traditional portrait/caricature of the man himself I created a surrealistic version of his office riddled with icons and aspects from the article. The individual elements where then ripe for the picking as symbols inside the text itself. The whole cover spread, front and back. Cover illustration without typographic elements. The opening spread of the essay, with a re-use of the cover illustration, inverted and with different colors. Example of a spread from the essay, with individual elements/icons from the Umberto Eco office scene. I made the cover illustration with this intent, and because of Umberto Eco's focus on iconography in his writings. Cover, thematic spread illustration and three vignettes for Prosa No. 2 2016 (Tidsskrift for sakprosa). The issue is called Guardians of Satire (Satirens voktere) and explores satirical litterature and the evolving forms of censorship in different european countries. The illustration without additional cover elements. Illustration for the opening spread of the main essay. A close up of the illustration for the opening essay spread. Vignett illustration for article about satire culture in Germany. A shameful past has now – in a growing scale – been allowed to be material for jokes. Vignett illustration for article about satire culture in Denmark. In this I transform the danish flag in to a white surrender flag. Vignett illustration for article about satire culture in France. 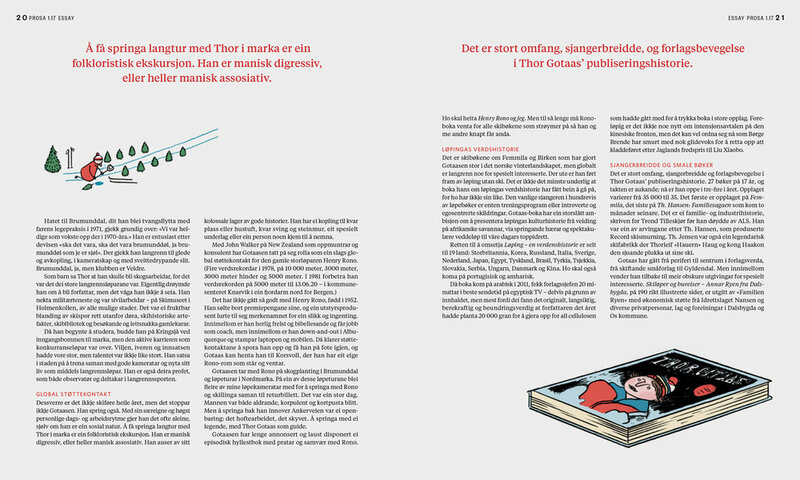 My debut as an editorial illustrator for Prosa (Tidsskrift for sakprosa) this year. With two illustrations for an article about exploring the qualitative possibilities of reviews through a new method of approach where author and book reviewer work together, reviews as a literary genre in itself and the relationship between the author of a book and the book reviewer.